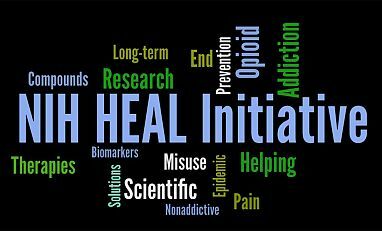 In 2016, there were 101 opioid-related overdose deaths­­­ in Vermont—a rate of 18.4 deaths per 100,000 persons and more than the national rate of 13.3 deaths per 100,000 persons. From 2013 to 2016 the number of heroin overdose deaths increased from 20 to 45 deaths. 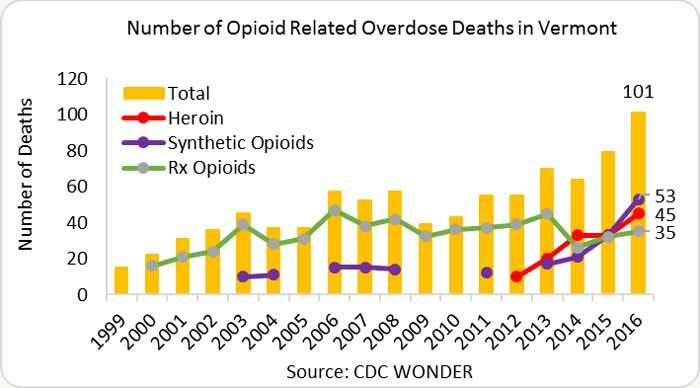 Like heroin, the trend of synthetic opioid-related deaths rose from 17 to 53 deaths during the same period. 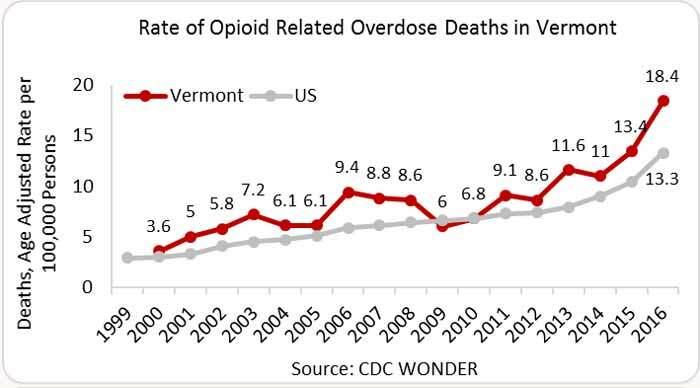 In 2015, Vermont providers wrote 62.0 opioid prescriptions per 100 persons (approximately 388,100 opioid prescriptions). In the same year, the average U.S. rate was 70 opioid prescriptions per 100 persons (IMS Health, 2016). According to a CDC study, the incidence of NAS in Vermont has increased from 0.7 cases per 1,000 births in 2001 to 33.3 cases per 1,000 in 2013, an almost forty-eightfold increase. The average across the 28 states included in the 2013 analysis was 6.0 cases per 1,000 births (CDC, MMWR, 2014). In a separate analysis using the Kid’s Inpatient Database, the Vermont NAS rate was 34.3 or 49.4 in 2013 and increased to 34.0 or 50.6 in 2015. The range is based on the use of one diagnosis code (the lower rates) or on the inclusion of two diagnosis codes (the higher rates). Both estimates, however, are much higher than the national rate and may be due to an automatic diagnosis of NAS given to infants born to opioid-dependent mothers. This practice of diagnosis contrasts with the general practice of diagnosing only those infants that exhibit NAS symptoms (Vermont Department of Health). State Incidence: Of the new HIV cases in 2015, 11 occurred in Vermont, with 26.7 percent1 of new cases in males and 50.0 percent of new cases in females attributed to IDU (AIDSVu). State Prevalence: In 2014, an estimated 662 persons were living with a diagnosed HIV infection in Vermont—a rate of 122 cases per 100,000 persons. Of these, 18.6 percent1 of males and 34.5 percent of females were living with HIV attributed to IDU (AIDSVu). State Incidence: In 2014, Vermont reported 4 cases of acute HCV and 903 cases of chronic HCV at rates of 0.64 cases per 100,000 persons and 144 cases per 100,000 persons, respectively. (healthvermont.gov). State Prevalence: As of 2010, an estimated 7,200 persons were living with HCV antibodies in Vermont at a rate of 1,450 cases per 100,000 persons (hepvu.org).